Luxury around every corner in this TW Lewis by David Weekley beauty in the exquisite neighborhood of Blackstone Country Club. On a 1/2 acre corner lot the serene sunsets and mountain views are sure to impress. This popular Yucca model boasts 3426 square feet with 3 spacious bedrooms and 3.5 upgraded bathrooms. The gorgeous gourmet kitchen with extended cabinets includes GE Monogram stainless steel appliances, beautiful granite slab counter tops, stylish two-tone cabinets, and subway tile back splash. The open concept Great Room features recessed ceiling and 16 foot sliding glass doors allowing the outdoor living in. Two generously sized guest rooms with en suite baths and walk-in closets. The owners retreat is decked out with top of the line finishes including marble counter tops, stand alone soaking tub with tile surround and floor to ceiling tile in the glass enclosed shower. Custom light fixtures throughout adds to the style of this delightful home. 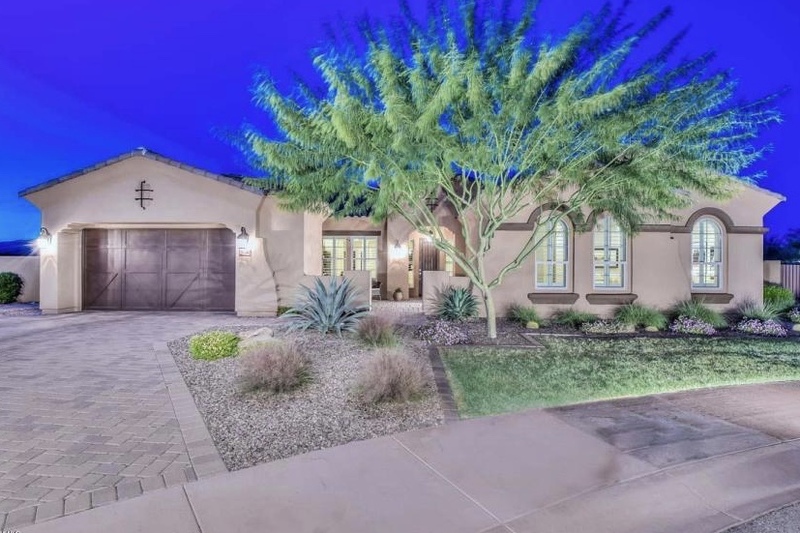 Step outside to Arizona living at its finest with stunning Travertine Pavers leading to a spectacular Salt Water pool complete with tranquil waterfall. Entertain friends and family with the built-in fire pit and over sized covered patio. Built-In Back Pack Storage just inside the 3 car tandem garage which also includes garage cabinets and workbench!